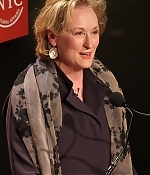 On November 12, 2010, Indiana University hosted “An Evening of Conversation with Jane Pauley and Meryl Streep”. 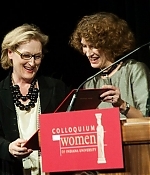 The program, which was free and open to the public, featured an introduction by IU’s first lady Laurie Burns McRobbie followed by a discussion between Pauley and Streep and concluded with a question and answer session with questions submitted by audience members. 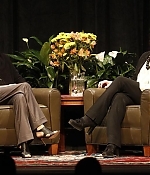 Pictures from the event can be found in the Image Library – a complete video of the conversation can be found at the IU’s official website. This is really a wonderful conversation to watch and listen to, a very insightful talk on acting and living, so be sure to watch it. 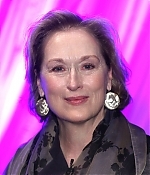 Pictures of Meryl’s appearance at the Mayor’s Awards for Arts & Culture, yesterday, have been added to the Image Library, with more information to come. Some UT theater students got a once-in-a-lifetime opportunity Friday. 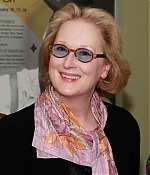 They got acting tips from two-time Academy Award winner Meryl Streep. 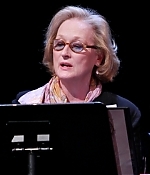 Streep visited the Forty Acres at the invitation of the University’s department of theatre and dance. Streep says her best advice to students is to set priorities. “You have to get your life right before you can get your art going. 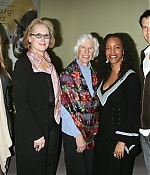 At least for me, as an actor, the things that really have mattered most are peripheral to your awards or the parts I’ve played,” Streep said. 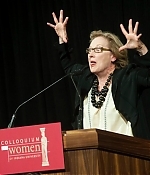 She continued, “Really the goal of your life is to be a good human being, and the more you know about everything, a little bit of everything, the more you understand the world around you.” According to KVUE Austin News, Streep says in her next film she will portray former British prime minister Margaret Thatcher. Their website has a video report on the evening, which can be watched below. Article courtesy the New York Daily News. 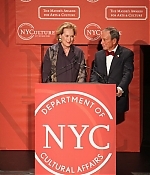 Mayor Bloomberg will team up next Monday with Meryl Streep to co-host the Mayor’s Awards for Arts & Culture at Alice Tully Hall. Bloomberg said he’s “excited” but also a little intimidated by the “Devil Wears Prada” star. “She is one of the greatest actresses of our time, so I’ve got a lot of rehearsing to do before next Monday,” said Bloomberg. 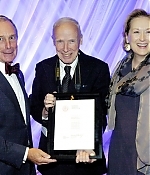 “The awards give us a chance to recognize the achievements of some of the people who make extraordinary contributions to culture in the five boroughs and help keep the city a vibrant place for artists and audiences,” Bloomberg said. New York City’s highest award for achievement in the arts, the Handel Medallion, will go to dance great and outgoing Alvin Ailey Artistic Director Judith Jamison. Other honorees will include photographer Bill Cunningham, Bronx Theatre High School Principal Deborah Effinger and Amy Fischetti-Boncardo, executive director of the Queens County Farm Museum. The Brooklyn Community Foundation and Staten Island’s Sandy Ground Historical Society are also slated to be honored. 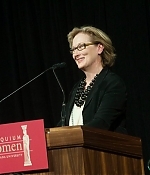 Indiana University announces a free event featuring Meryl Streep and Jane Pauley on Friday, Nov. 12 at 4:30 p.m. at Indiana University Auditorium. 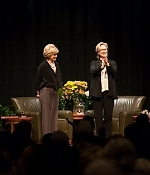 Entitled “An Evening of Conversation with Jane Pauley and Meryl Streep at Indiana University,” the event is free and open to the public. On Nov. 1 at 10 a.m., tickets will be available in person at the IU Auditorium box office for IU Bloomington students, faculty and staff with valid ID; tickets will be available for the general public on Nov. 3 at 10 a.m. 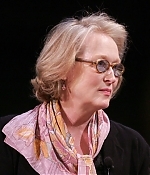 The program will feature an introduction by IU’s first lady Laurie Burns McRobbie followed by a discussion between Pauley and Streep. The evening will conclude with a question and answer session with questions submitted by audience members. More information can be found at the University’s official website.